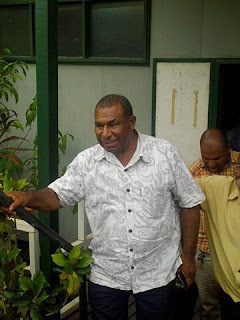 Police in Papua New Guinea on Thursday arrested the director of the National Fraud and Anti-Corruption directorate, Matthew Damaru.Mr Damaru's lawyer said his client was taken in for questioning by officers of the police internal affairs division and were expected to charge him with abuse of office. The arrest follows a previous attempt to detain Mr Damaru on Wednesday, apparently on the orders of the police commissioner, Gary Baki. The allegation relates to Mr Damaru's arrest of the Supreme Court judge, Sir Bernard Sakora, in April on suspicion of judicial corruption. That case was thrown out by the National Court last week. But it highlighted a glaring division between the police hierarchy and anti-fraud squad officers who've been probing a major corruption case that implicates the Prime Minister, Peter O'Neill. Following Sir Bernard's arrest, Mr Baki ordered the closure of the anti-fraud squad's offices, a decision that was overturned by the National Court.